April 19, 2018 | Meagan Miller & filed under awesome, Special Events, University of Alberta. Listen in throughout the day for bite-sized stories from Edmonton’s Chinatown. 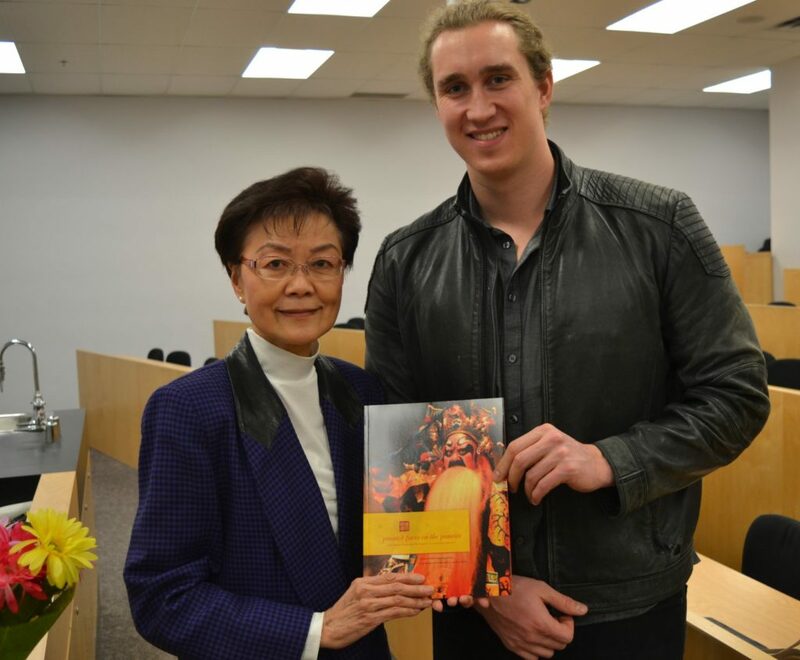 Have you ever been curious to learn more about Edmonton’s Chinese community? Over the next couple weeks, CJSR will be presenting 3-minute stories sharing stories about everything from the 1953 Klondike Days parade to the building of the Harbin Gate. You can tune in every week day from April 23 to May 15 to hear these mini-documentaries. They’ll be airing at 7:30 AM, 1 PM, 4:30 PM, and 9 PM. They’ll also be available on CJSR’s SoundCloud page. It’s all part of a project CJSR has been contributing to called Figure 一，二，三，六，八. The gist is that we are trying to use paintings, radio, video, and archival materials to show that Edmonton’s Chinatown is a place that’s full of stories and life. 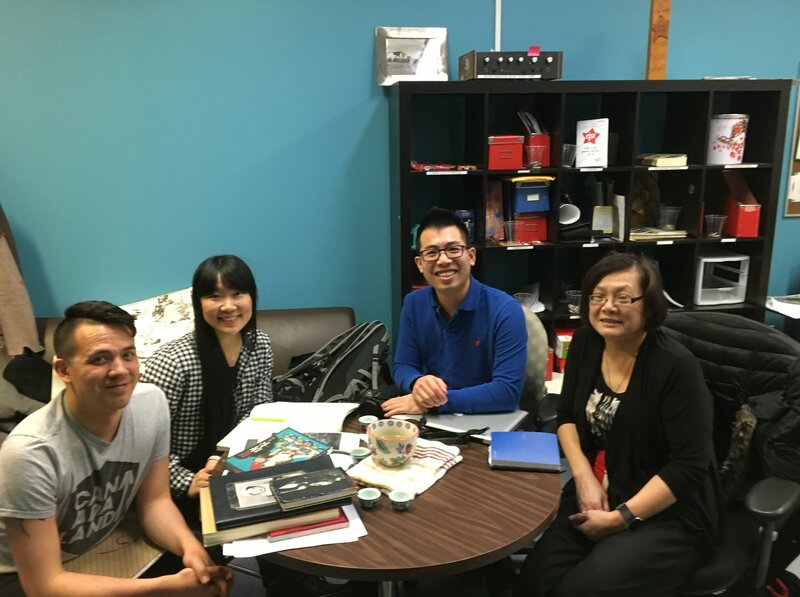 Chris Chang-Yen Phillips, Cui Jinzhe, Shawn Tse, and Lan Chan-Marples in CJSR’s news room. Shawn Tse approached CJSR News Coordinator Chris Chang-Yen Phillips about this idea last summer. Chris had recently become familiar with artwork by Cui Jinzhe – a local artist who uses traditional Chinese brushwork and visual language to explore ethereal subjects. Dreams and gods, and sometimes objects or people from our own time. Shawn’s idea was to ask Jinzhe to apply that style to a series of paintings, each capturing a different era in Edmonton’s Chinatown. Starting with the 1890s when John Kee/Chung Kee first arrived in Edmonton, and working forward to 2018. Along the way, Shawn would make a video documentary about the process. 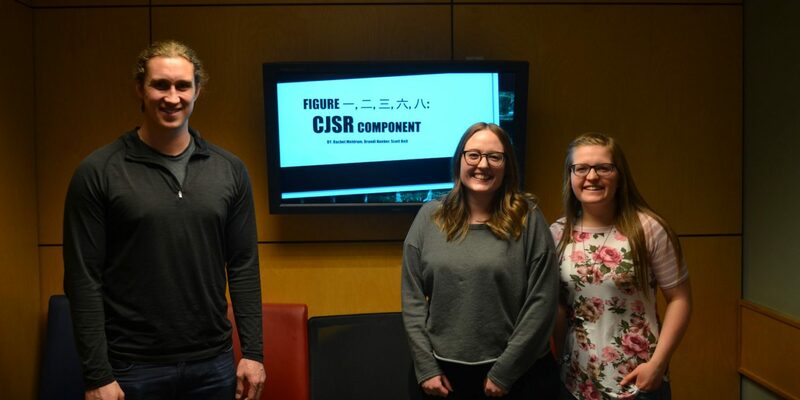 So we found a way that CJSR and Lan Chan-Marples at the U of A could contribute to the research. We decided Lan and Chris would each supervise a team of U of A students through the Community Service Learning program, and guide them through the process of digging up stories to inspire the paintings. 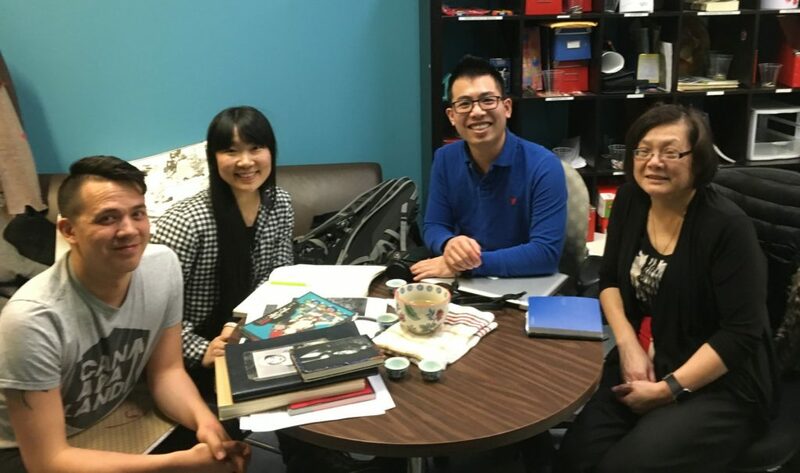 So with the generous support of the Edmonton Heritage Council and ASSIST, a group of students from Shannon Stunden Bower’s HIST 377 class have been working with us at CJSR to capture memories of Edmonton’s Chinatown as tiny (3-minute) radio pieces. And Lan’s students have been digging up archival material about buildings and architecture in the area. 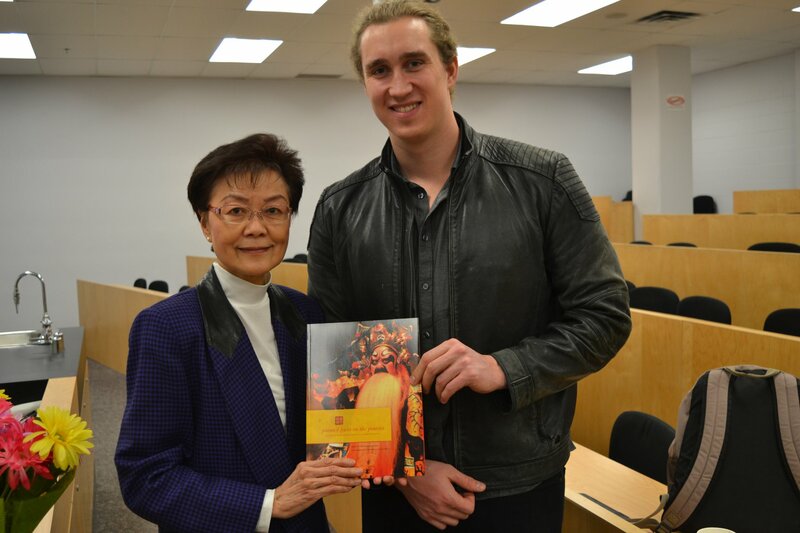 Helen Kwan Yee Cheung with her Cantonese opera history, Painted Faces on the Prairies, and her interviewer Scott Bell. The three students working with us – Scott Bell, Brandi Kueber, and Rachel Meldrum – have recorded some really fascinating stories. Ken Gee has spoken with us about picking goji berries on Grierson Hill with his grandma. Helen Kwan Yee Cheung has spoken about the conflicts between communist and nationalist sympathies that spilled out into local Cantonese opera performances during World War II. And Patrick Tso has spoken about a local Chinese computer society. We’ll be sharing a total of 17 stories they created along with Chris. Stay tuned, because the artwork and video documentary will be ready late this year or in early 2019.